Author's Note: In the second half of my 2013 interview with Alice Sebrell, Program Director of Black Mountain College + Museum (BMC+M), we start by talking about, John A. Rice, the founder of Black Mountain College (BMC). From there, the conversation moves to A Radical Vision, which was an educational exhibition presented by BMC+M. Too this, Sebrell talks about 80th anniversary of BMC, which coincided with this interview. And the discussion closes with Sebrell sharing her thoughts on how students can benefit from education today. ME: And of the school’s founder, John Rice, I’ve read he was unflinching in his passion for education, that he was a genius, and his love for teaching and learning far outweighed his interest in institutional bureaucracy. To this point, Rice was no stranger to controversy. Who was this man? AS: I think your description is accurate. He was a brilliant man. I think he could be caustic or impatient with people sometimes; people who weren’t as quick or intellectual as he was. So I think he stepped on some toes, and you could say that about many figures at the college. They moved along at a quick pace. It was your job as a student or college to keep up. They weren’t going to coddle you. ME: Others have their viewpoints, but from what you know about him what might John Rice say about himself? AS: I’m guessing here, but I think he might say that he was misunderstood. And, I think he would say that even though the college didn’t last beyond 24 years, it was very successful, and that not all radical visions in education succeed in terms of time. That that’s not the true measure of success and that he started something great that’s had a lasting impact. ME: It’s clear that the Bauhaus was influential to BMC, and in many ways the schools mirrored one another. Could you talk about some of the similarities and differences with each school? AS: The first similarity that comes to mind is this idea of workshops in the arts, that that was the model that they had at the Bauhaus, and was brought here through Joseph and Annie Albers. Also, the idea of experimental performance, theatre and interdisciplinary activities in the arts—that would be a similarity. Another would be the fact that the Bauhaus moved—three different locations in its short life—and Black Mountain had 2 different homes. And that kind of thing would not allow for any sort of entrenched or ridged way of getting into a rut. At the first place at Blue Mountain Ridge, they had to go away every summer. So each fall they set up a new, and that’s certainly uncommon. ME: Yes, a radical approach to living and learning. AS: They were living on the edge. At Black Mountain College they were always financially living on the edge. And at the Bauhaus, in the final years they too were living on the edge; in terms of the politics going on around them. The main difference—from afar, my impression is that the Bauhaus was better funded, and larger. ME: The Bauhaus was a government funded project. So, they had those coffers to draw from. AS: Yes, so they had a little more stability in that way. AS: I would say that it was community by design, and they certainly made sure that it continued that way through the life of the college. It was also by necessity, to some degree. Community was part of the vision of the founder of the college, and that contributed to the intensity of that community because not only was it a group of people who saw each other all the time, but many of them were creative geniuses. That aspect also factored into how it has a lasting impression on every one. And I think it’s certainly different from almost every college or university today. That’s [community] not a part of anybody’s vision today. ME: More specifically, how so? 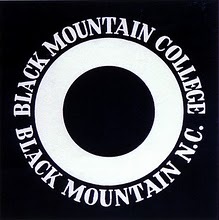 First of all it has to be very small, and there are very few colleges as small as Black Mountain was. There are some that are small, but they are quite different. AS: How refreshing, is what I would say—that the responsibility for one’s choices, one’s education, one’s life, is left is in their own hand. AS: Well, I think that’s true. The history of the college confirms that. There were periodic skirmishes, and epic battles. And if you read about some of those battles there is an admission that people’s egos got the best of them, where they were engaged in a particular struggle not so much because they felt they were arguing for the right point of view, but for the struggle itself. And it became important [just] to win. These are all very human experiences that we obviously still face today. But that experience of an intense community can be uplifting, and can lead to incredible accomplishments that perhaps wouldn’t be possible otherwise. It can bring out that absolute best, and sometimes worst, in a human. ME: With this year being the 80th anniversary of the school, what lessons might educational administrators and educational advocates learn and employ toward enriching and improving their own learning institutions? AS: This is just my personal opinion: I think that the direction that education has gone in recently where it’s all about testing and memorization is just diametrically opposed to what was going on at Black Mountain College. So I personally feel that maybe getting away from this current direction, and maybe heading back a little bit more towards education of the whole person—experimental education, and some of these ideas that Black Mountain College borrowed from John Dewey—might be an approach that leads to a more informed and engaged citizenry. ME: Any last thoughts about the enduring legacy of the school? AS: I guess for us, not only is it an anniversary of Black Mountain College, it’s also the 20th anniversary of our Museum and Art Center. We’re pretty proud of that, and we hope that in what we’re doing the alumni would see our effort as worthy. The work we do in some sense is an echo; honoring some of those important ideas and approaches to living that they carried out at the college. ME: And to students today, regardless of where they may be, what would you say to them in the spirit of learning and growing that they could draw on from the legacy of Black Mountain College? I would say that to follow that compass driven by interest and passion. It doesn’t usually lead us astray.